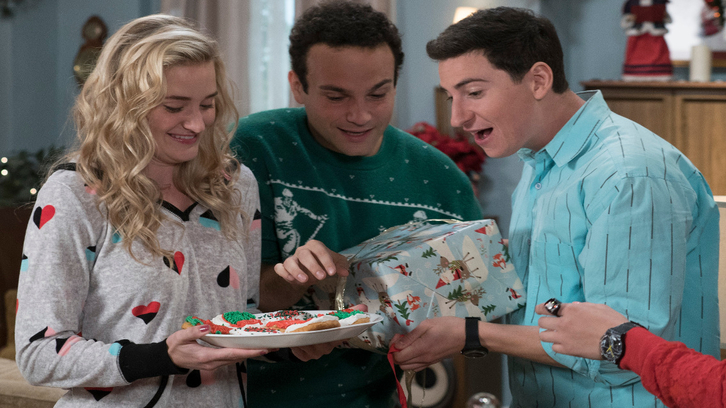 The Goldbergs came back from its winter break this week with Lainey's farewell episode, as she left the show and jumped forward 10 years to The Goldbergs spin-off Schooled. Before we jump into this weeks episode though, let's go back a few weeks to the Christmas episode Yippee Ki Yay Melon Farmer, as due to injury + being extremely busy over the festive period, time once again ran away from me. Obviously it wasn't the way it was intended but spending my Saturday watching episodes 10 & 11 together was a lot less draining than it probably would've been with the break. I've never hid the fact Barry Goldberg isn't exactly my favourite character. It's no fault on the actor Troy Gentile, who has more than shown he has dramatic and comedic chops, but Barry Goldberg really is only a character I can deal with in small doses. Sometimes he works taking centre stage in an episode, but more often than not he doesn't and that was made extremely apparent in the Christmas episode. it's been over 24 hours now since I watched and I still feel baffled by just how senseless and selfish Barry can be, which he's rarely ever called out on and instead he ends up dragging more people down with him which doesn't seem at all fair. He's been brought up as a Jewish person and Jewish people celebrate Hanukah. Since Lainey and her dad aren't Jewish, Barry's overjoyed that this year he'll actually be able to get into the Christmas holiday spirit. Beverly isn't happy with this at all and the two of them get into a Christmas jumper-off, which ends when Beverly's jumper breaks. Given that Barry has been dating Lainey for a number of years, and she's also Erica's best friend which means she's been in his life a long time? He should know that she and Bill don't celebrate Christmas because that's when her mum up and left. Given the fact Lainey and Barry were engaged to get married? He should've been respectful to that, apologized for the misstep in bringing back bad memories for both of them, and just invited them to spend Hanukah with the Goldbergs, given at this time their two families were set to merge. It would've been a nice, easy, caring solution. Instead because Barry's a do first think later type of character and all he can think about is himself, he tricks Beverly into thinking Bill and Lainey are having the Christman to end all Christmas's, and because Beverly has to always be the best at everything, she's soon putting on a showstopping Hanukah celebration. Erica and Geoff go along with it because that's just what they do. I can't actually fault them for that. Not when Erica is on top form with her whole 'I have no objections to this I just wanna make sure I know the plan so I don't misspeak'. Barry soon brings Lainey and Bill round to the house where Beverly has created a holiday wonderland. They're both completely and utterly gobsmacked by how great everything looks, and very much beginning to feel the holiday spirit. Considering Beverly went to a massive effort, you'd think Barry would've been satisfied that he has for once had his dream Christmas but no. He has to keep telling Bill that the next day will be even better than the last, and is completely ignorant to the fact that what he's doing is zapping every inch of energy from Beverly. By the end of it she is so exhausted that they find her on the couch all mummed out, and she's conceding defeat to Bill and Lainey who have no idea what she's talking about. Rather than just own up to his actions, Barry's still convinced he can lie his way out of it by talking to them all separately, but soon the jig is up with Bill admitting he and Lainey don't celebrate the holidays, Beverly admitting she doesn't usually do Hanukah so extravagantly, and Lainey realizing that Barry lied to all of them and Beverly to an extent went along with it. Emphasis very much on to an extent considering Beverly was manipulated into her antics, but no-one's interested in the semantics as Bill and Lainey are left annoyed and leave the house. Barry & Beverly feel terrible, even though Barry's the only one who should, and Barry wants to make things up to them but doesn't exactly know how to considering Christmas is a foreign concept to him. Eventually though they do put things right by giving Bill and Lainey the simple holiday that they've never had, surrounded by their second family. It is a sweet moment and a nice gesture, but as meaningful as the moment was probably supposed to feel, I actually walked away feeling nothing at all considering it was a mess of Barry's making and only served to unintentionally show that he still has a lot of growing up to do and is far too immature to be marrying anyone. The only storyline of the Christmas episode centered around Uncle Marvin coming to visit again which is always a disaster. This time he convinces Adam that he's gonna be the big star of a Network TV show, and as a result Adam thinks that they can remake everyone's favourite Christmas movie Die Hard. Probably committing an immortal sin here, but I've never seen any of the movies and have no desire to. The title of the episode comes from the TV network the Goldbergs were watching the movie on changing up the words of the movie because obviously no swearing on Network TV. Adam isn't exactly happy with this, and where Murray usually puts a kibosh in Marvin's crazy schemes, he decides to take the holiday's off and let them do what they want. That ends in Pops and Murray discovering Marvin's big TV show is actually an episode of reality TV show Cops. Murray doesn't want to break it to Adam that Marvin is going to let him down again and instead has it out with his brother, who does what he does best; runs from the confrontation and leaves Murray to pick up the pieces. That he does, but is pleasantly left surprised when he and Adam go to the movies and Adam's Die Hard remake trailer does indeed play. Moving onto this week and it was all about planning for Barry and Lainey's wedding. Ever since they got engaged in the season 5 finale, it's been extremely difficult to root for their relationship given we have known at some point they would have to split up because she was leaving the show. So instead of being excited about the build-up to their wedding, and watching them evolve and grow together, all we've instead been waiting on is what would break the ducks back. Not necessarily a fault of the show since it was somewhat impossible to keep Lainey's departure secret, but they could've done better with the build-up to them splitting. It was partially about them being two different people on two different journey's, but mostly dumbed down to both of them admitting they'd been rather impulsive with the engagement and wedding, and didn't actually want to go through with it but because so many people were against it, that'd spurred them on to go ahead with it. Barry confessing his true feelings to Erica, and then readying himself to tell Lainey and them both being in suspense over her reaction only for Lainey to be delighted was probably played for laughs but it just fell flat. Beverly suddenly becoming a Bridezilla mum who wanted the perfect wedding for them to make up for her own lack of a perfect wedding also felt untrue. Granted most of this was a set-up for the crossover with Adam Sandler's 'The Wedding Singer'. I'll admit it's yet another 80's movie I have never watched. Having watched quite a few film & TV shows over the years though, and my fair share of online edits, attempting to crossover with a piece of material that is already established is extremely difficult. It's even harder to fit your canon characters and storyline into it, whilst making it all fit seamlessly and naturally without feeling jarring to the viewer, and The Goldbergs achieved that perfectly. Again I've never watched 'The Wedding Singer' so can't even tell you the names of the characters Adam Sadler and Drew Barrymore played, and yet I perfectly understood the parallel of the storyline. Barry and Lainey might be madly in love with each other, to such an extent Barry was willing to leave his family behind and go with Lainey so she could live out her dream, but sometimes love isn't enough. Sometimes you need time apart to grow, to live out your dreams by yourself because otherwise resentment can kick in, and then if you find your way back to each other, everything is brilliant. The Wedding Singer also brought up an interesting piece of character development for Adam. Since the show began he has been making home videos and likes to inject humour into things, but with the wedding fast approaching, Adam was hoping to be the person to film it. That's not something Murray was willing to allow, as judging by his last wedding video, Adam is incapable of taking things seriously. He always has to inject humour into everything, so he turned to Geoff for help and they filmed Pops talking about extremely emotional stuff to prove to Murray that Adam can be serious. Unfortunately that didn't go too well as Adam found Pop's story far too heavy for his taste and just couldn't resist lightening things up. He accepted that he had a major problem, and revealed to Geoff that growing up in the family that he does and going to school where he is ridiculed? Humour is his escape and what essentially keeps him sane. It's an extremely good point to make as many people every day use humour and sarcasm as a way of coping with their feelings. It's not necessarily the best way to go about things, but it's sometimes all that people have. Geoff was pleasantly surprised by the breakthrough but of course as things got too real for Adam, he was soon making funny noises. With Lainey unable to say goodbye to everyone face to face, she enlisted Adam's help to make a goodbye video but Adam just couldn't convey the serious message that Lainey was trying to put across. All hope wasn't lost though as eventually, by the episodes end, Adam was able to let a bit of reality into his life and produce a video of Lainey and Barry's best moments throughout the show. It was full of heart and emotion, and served to show just how much Lainey and Barry have grown as characters since the shows beginning and Lainey's introduction. I haven't always been a fan of their relationship which is mostly an issue with the writing, but no comedy is ever perfect. The Goldbergs has been on screen for 6 years now and whilst not every episode is overly amusing, the storylines are still engaging, the characters keep growing by the season, all of the actors are terrific and have a wonderful chemistry which reflects on screen, and it has now managed to successfully get the spin-off going, and new fans are constantly finding the show so it must be doing something right!